For 2019, we’ve decided to add onto our webinar programming following some fantastic feedback we’ve been receiving from our audience and launch a “hands-on” webinar series: Pulse Online. 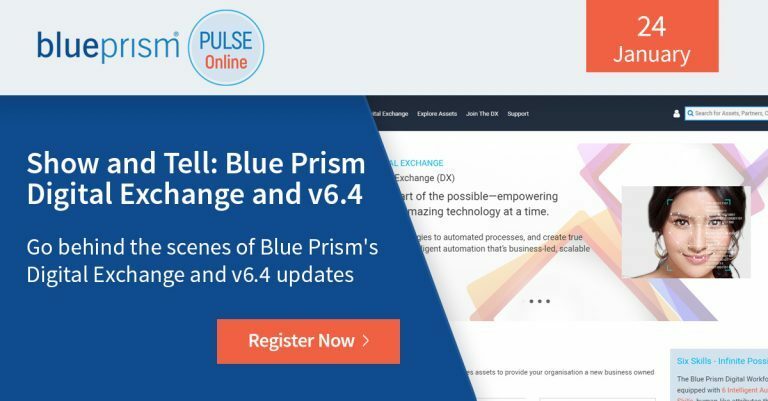 Pulse Online will become Blue Prism’s product and technology focused webinar series. Every last Thursday of the month, get hands-on demos, tactical insight and best practices for taking your Digital Workforce to the next level from internal Blue Prism experts. We will be kicking off our programming in style with our 1st episode airing on January 24th where we will be taking you behind the scenes of the newly-launched Blue Prism Digital Exchange and show you all the new exciting features that were launched in Blue Prism v6.4. This live webinar will also give the audience the opportunity to ask their questions to our panel of expert presenters. We look forward to seeing you online on January 24th!